In Vashnavism, he is the Supreme Self and the Lord of the universe, who manifests variously as part of His obligatory duty. The Vedas recognize him as a solar deity (Aditya) and extol him as the god of three strides, upholder of law and giver of boons. 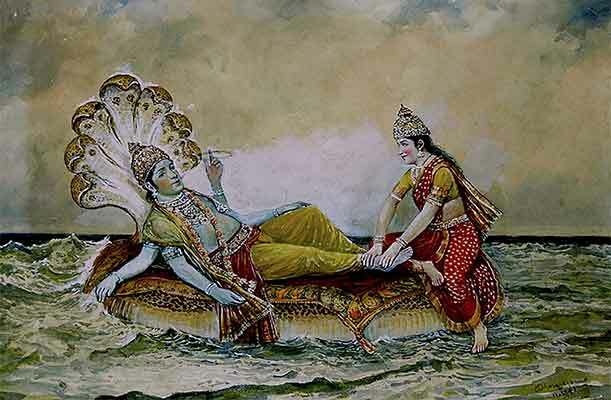 In course of time he became Narayana, which literally means, the dweller of waters and dweller of human beings. The word nara means both water (naram) and human (nara). Vishnu resides in the milky waters of Vaikunth on a bed made of the coils of the the thousand hooded great serpent, Adishesha of infinite dimensions. Goddess Lakshmi, his consort attend upon him. Symbolically the ocean stands for bliss and consciousness, the serpent for time, diversity, desire and illusion, and the goddess Lakshmi for the material things and powers of the creation. 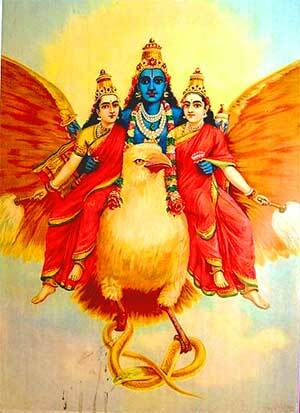 The color of Vishnu is the color of a dark blue cloud. It is the color of the sky, denoting his cosmic dimensions and his connection with the Vedic gods of rain and thunder and his relationship with the earth. He is usually depicted with one face, four arms, usually in a standing posture or in a resting posture. He wears a necklace made of the famous Kaustubha gem that rests on his left chest and another garland of flowers and gems by name Vaijayanti. His four arms hold sankha (a conch), chakra (discus), gada (mace) and padma (lotus) respectively. The conch stands for the five elements, the sound of AUM, salagrama, goddess Lakshmi, the waters, purity and perfection. The discus is the terrible weapon of Vishnu which he used to destroy the evil and protect the righteous. It symbolically represents the light bearing sun, which illuminates and removes darkness. It also stands for higher consciousness which destroys all illusions. The mace represent the power of knowledge while the lotus symbolizes beauty, harmony, purity, water element, creation and self realization. As stated in the Bhagavad gita, whenever evil gains ascendance, God incarnates on earth to restore dharma, punish the evil and protect the weak and the righteous. Generally all incarnations of God are associated with Lord Vishnu, because Vishnu is the preserver of the worlds and the purpose of an incarnation is also the same. The list of Vishnu's incarnations varies. The number of incarnations that is generally accepted is ten of which nine have already taken place, while the tenth one is yet to come. In some versions we come across a list of 23 incarnations of Vishnu , which includes the names of Dattatreya, Satvata and Vedavyasa. 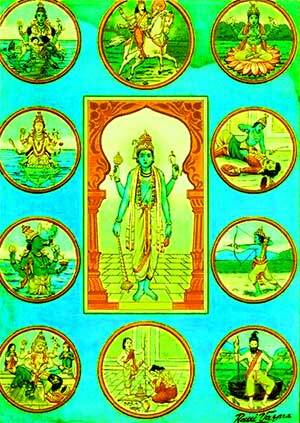 The generally accepted nine incarnations are: the fish incarnation (matsyavatara), the tortoise incarnation (kurmavatara), the boar incarnation (varahavatara), the man lion incarnation (narasimhavatara), the dwarf incarnation (vamanavatara), the incarnation of Parasurarama (parasuramavatara), the incarnation of Rama (ramavatara), the incarnation of Balarama (balaramavatara), and the incarnation of Sri Krishna (krishnavatara). The tenth incarnation, the incarnation of Kalki, a ferocious god is yet to come. The list of incarnations some time include the incarnation of Buddha in the place of Balarama. The fact is that a lot of myth is woven around the theory of incarnations. As we have already noted, some of the incarnations ascribed to Vishnu were previously ascribed to Brahma. Secondly none of the incarnations declared themselves as incarnations of Vishnu. Attempts were made to bring the Buddha as an incarnation of Vishnu. This was probably to bring Buddhism into the fold of Vaishnavism in response to the increasing popularity of Saivism whose followers viewed both Vaishnavism and Buddhism with the same disdain. While we are not certain about the authenticity of the list of incarnations or the events associated with many of the incarnations, the idea of incarnation itself is a plausible and logically acceptable idea. It perfectly fits into the concept of God as the creator and upholder of dharma and rta (order and balance) in the universe. The more enlightened version of the theory of incarnation is that God chooses different ways to restore order and balance in the universe. One is by the direct descent, with all his powers latent in human form and with all his attendant or associate divinities also joining him on the earthly plane to assist Him in His work. This is the incarnation proper (purnavatara) such as the incarnation of Rama or Krishna. He assumes this form only when an evil of gigantic dimensions rises its head and start fomenting trouble every where. Second, only an aspect (amsa) of Him manifests on the earth in the form of a great soul for a specific purpose, generally as a seer, a guru , a ruler, or an artist. The incarnation of Vedavyasa or Dattatreya comes under this category called partial manifestation or amsavatara. Third, He does not descend at all, but chooses a particular human being as his vehicle and sends into him knowledge or messages, answers and solutions. Many prophets, inventors, and saints of revelations who were able to open specific channels of communication with God or whom God would choose to speak, come into this category. Some one like Neale Donald Walsch of the Conversations with God fame, if he is telling the truth, can look for a place in the list here. Fourth, He would incarnate somewhere else in one of the three aforesaid ways, but incorporeally and help the earth in a general way. We do not have much idea about these incarnations. But strictly speaking all the manifestations of Brahman as various gods and goddesses in various worlds, including that of the Trinity are but his incarnations only and can be included in this category. These are gods who descended into this world for a specific task and with an aspect of Lord Vishnu. Mention may be made of Dattatreya, Kapila, Dhanvantari, Mohini, Hayagriva, Naranarayana, Vedavyasa and Yajna. Dattatreya: Son of Atri and Anasuya, who achieved complete mastery of the Vedas, Dattatreya had perfected the rites associated with soma juice and invoking of higher powers through magic and some kind of tantra. He also assisted those who were outside the pale of Vedic religion with the teachings of the Vedas and helped in their assimilation into the Vedic society. Probably for this he was given the stamp of impurity and denied his due honors. However it seems that subsequently his status as a divinity was recognized and restored. He is described as having three heads, four hands and always followed by four faithful dogs. The three heads denote his connection with the entire Trinity, not just Vishnu. His four hands, signify his divinity and supernatural status and the four dogs following him symbolically represent the four Vedas and his mastery over them. Kapila: Kapila was the founder of Sankhya school of philosophy, the author of Kapilasutras. Sankhya philosophy gained immense popularity in ancient India and provided inspiration to many scholars to speculate about existing religious beliefs. Probably the inclusion of Kapila as a minor incarnation of Vishnu was an attempt to bring some rapprochement between Sankhya philosophy and the Brahmanism, just as there was an attempt to consider the Buddha as an incarnation of Vishnu to bring a rapprochement between Buddhism and Vaishnavism. Sage Kapila said to have cursed the sixty thousand sons of Sagara and reduced them to ashes, which later prompted Bhagirath to undergo severe penances and bring down the Ganges that was flowing in the heavens. We are nor sure whether this Kapila is the same as the founder of the Sankhya philosophy. Dhanvantari: He was probably a famous physician in ancient India, endowed with an excellent knowledge of herbal medicines and miraculous healing powers. In the mythological story of Sagarmanthan (the churning of oceans), we come across the name of Dhanvantari. After the gods and demons started churning the ocean in search of immortality, Dhanvantari said to have appeared before them with a vessel containing the ambrosia in his hands. 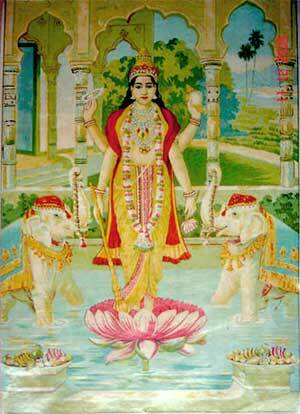 We therefore do not know whether Dhanvantari is a title given to an expert physician or the name of an individual. Whatever be the truth, Vishnu is also a great healer because healing is a part of his work of preservation. Since Dhanvantari was a great physician, he was probably accepted as a minor incarnation of Vishnu. Hayagriva: He reintroduced the lost knowledge of Yajurveda to the mankind, through Yajnavalkya and probably existed in the post Rigvedic period. He is believed to be an aspect of Vishnu as the Sun god and is described as a deity with the head of a horse. In the images he is depicted as having eight arms carrying the various emblems of Vishnu. Mohini: Mohini deluded the demons and prevented them from partaking the ambrosia. Mohini is regarded as an incarnation of Vishnu because delusion is an important weapon in the armory of Vishnu, for which he is also called mayavi, the creator of illusion. Mohini deluded even Siva resulting in the birth of sage Maya Machchindra. Nara-Narayana: Nara means human and Narayana means the Supreme Self. Arjuna and Sri Krishna are popularly referred as Nara and Narayana. There are mythological stories explaining the origin and exploits of Nara and Narayana, who are also credited with the story of creation of Urvasi the celestial nymph and the slaying of a demon with thousand armors (types of ignorance). We however believe that any human being with awakened divinity in Him and works for the welfare of humanity is a Nara-Narayana, an incarnation of Vishnu on earth working for the preservation of the dharma or righteousness. In the images Nara and Narayana are shown either jointly or separately. When they are shown separately, Nara is shown with two heads and wearing a deer skin while Narayana is shown on its left with four arms carrying the usual emblems of Vishnu. Yajna: Vishnu is considered as Purusha who was born out of sacrifice and was also sacrificed in turn. In the Bhagavad gita, Sri Krishna says that Brahman is ever present in the Yajna (brahma nityam yajne pratisthitam) and that God is the enjoyer (bhokta) as well as the lord (prabhu) of all sacrifices. In His incarnation as Yajna, Vishnu is called Yajneswara or Lord of the Sacrifice. In this form he is usually depicted with two heads, seven hands, three legs and four horns. His seven hands carry different objects which are generally used in the performance of the Yajna. Ved Vyasa: Vedavyas is the author of the famous epic Mahabharata, the Puranas and the Brahmasutras. He is also credited with the division of the vedic hymns into the present form of the four Vedas. Vedavyasa is the codifier and preserver of human memory and knowledge in the form of immortal writings and hence his identification with Lord Vishnu. Vedavyas is generally depicted as a seer, with knotted hair, slender in form and darker in complexion, in the company of his four disciples, namely, Jaimini, Paila, Vaisampayana and Sumantu. The following gods are also considered to be manifestations of Vishnu in venerable form (arcavatara). These gods are very popular and are worshipped regularly by millions of devotees. They are actually responsible for the popularity of Vaishnavisim Vishnu is generally worshipped in various aspects, and seldom in his form. Lord Satyanarayana: He is the Lord of truth (Sathya), a very popular deity who is generally worshipped in the households on specific occasions as a part of a penance (vratam). Garuda: Garuda is the bird vehicle of Lord Vishnu, who is found in every temple of Vishnu generally in front of the sanctum sanctorum. In the Hindu mythology, he carries Lord Vishnu whenever the latter travels from place to place. In the images he is shown as standing or sitting on one knee, hands joined in adoration, with an eagle nose, sharp features, and two wings. Some times he is shown with additional hands of four or eight carrying a snake, a vessel of ambrosia, a sword, a mace, a wheel, a conch etc. These are the objects of Vishnu which he carries in his capacity as his attendant. Namam: A U shaped mark with a vertical stripe in between. Worn by devoted Vaishnavites on their foreheads. Salagrama: It is Vaishnava's equivalent of a Siva ling, a fossilized shell of a mollusc, with a lot of whorls inside, resembling a galaxy in motion, which is worshipped as a symbol of Vishnu in the households of devote followers. 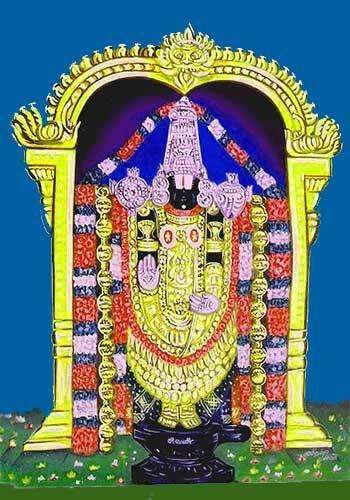 Attribution: The image of Vishnu and Venkateswara used in this article are either in public domain or licensed under the Creative Commons Attribution-Share Alike 3.0 Unported license. However, the images may not be in public domain in some countries.